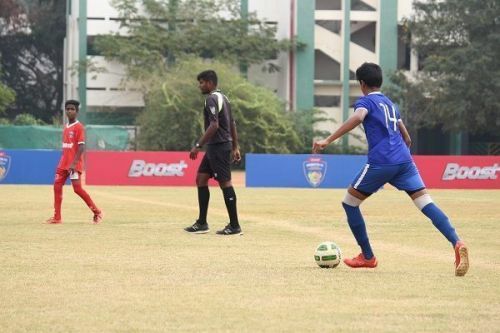 Day four of the BOOST-Chennaiyin FC Football Championship got underway with a big win for Seventh Day Adventist in the U-13 age group knockout round, who won 6-0 against Sri Sushwani Matha Jain Vidyalaya. Hat-tricks from Vineeth and Jagadeesh seeing Seventh Day coast to victory comfortably. This was the only U-13 category game played on day four. The five other fixtures played were all in the U-15 category. The U-15 team from Seventh Day however was knocked out after a 1-0 defeat to Chennai Public School. Vidya Mandir beat Seetha Kingston 5-0, courtesy braces from Rajiv and Sarvesh. SBOA U-15s were the other team to win big, again with a 5-0 scoreline against CSI St. Thomas Matriculation School. Chinmaya Vidyalaya, Virugambakkam then beat Nellai Nadar 2-1 as St. Mary’s Matriculation lost 3-0 to Chettinad Vidyashram. The latter game saw the third hat-trick of the day, coming from Chettinad’s Sethuraman.